Today I took my Okinawan kobudo weapons outdoors and went to town. I know that's a bit of an oxymoron, but I'm just trying to make a point. There's just not too many schools that will structurally accommodate the swinging of a six foot bo. In my day I've come too close to breaking the overhead florescent bulbs (also six feet in length, ironically) wielding my weapon with reckless abandon. I like to feel free when I train. Does your school ever conduct training outdoors? One summer day we took a class down to the beach for a two mile run followed by some basic drills done in the surf while drawing some spectators. Kicking in knee-high water provides a tough workout. Peter Urban, the legendary goju karate pioneer in the States, would occasionally have his uniform clad students run down the streets of New York outside his famous Chinatown dojo. I admit, Canal Street bears no semblance to a nature trail, but I'm sure a group of karate trainees jogging across busy Manhattan intersections was cheap advertising for Urban's school. Most of the twentieth century founders favored rigorous outdoor training at some point. As a youth Gichin Funakoshi would practice kata during the midst of a raging typhoon to forge his spirit. 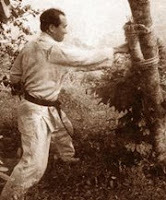 Mas Oyama spent extended periods in the wilderness performing karate and Zen meditation under frigid waterfalls as part of his shugyo (austere training) regimen. Fitness guru Jack LaLanne used to run these TV ads during the 70s for his health clubs with the promise of escaping the winter chill ("Baby it's cold outside!"). The classical dojo was not designed as a total haven from the elements - a departure from the insulated, air conditioned modern facilities. As historian Donn Draeger noted, the traditional training hall is "hot during summer, cold during winter; it has approximately the temperature of the environment beyond its walls." I really don't recommend training during extremely hot or cold conditions unless certain precautions are taken. Keeping yourself hydrated is a must during any strenuous activity, especially in the heat. Stretching and warming up the muscles and connective tissues is imperative prior to training, particularly when it's cold. For me, martial arts training outdoors is ideal. There's nothing like it: fresh air, freedom, sunshine (when available) and if you live in the 'burbs like me you benefit from the surrounding oxygen-exuding plant life. Such is the symbiosis of living on our planet, for now, as long as we don't continue to ravage her natural resources. My son and I do most of our training outdoors in the backyard. We have a makiwara and a heavy bag out there, and there is plenty of room to maneuver. The makiwara is planted firmly underneath the overhanging boughs of a neighbor's tree. During the Spring and Summer, we're covered with a canopy of leaves while we hit the thing. It's actually quite picturesque. 'Course, I'm sure the neighbors think we're insane. We have plans to head out to a park or beach and roll as weather permits this Summer. The Brazilians are often filmed working out outdoors, and an entire sub-group within BJJ strongly endorses a very interesting type of bodyweight training that they call Ginastica Natural that is often done outside. There is something about working out outside that gives training a completely different feeling. The building in which the school I attend is housed, at one time did some sort of automotive service. There is still a big garage door on one wall. When the weather is nice, the door is open. When the place is particularly crowded , the class can spill out into the parking lot. About 5 years ago, my gym was changing location to a bigger establishment just around the corner. It took about 10 months. in the meantime, we trained at parks, public halls, even on back streets. Practising grapling is COMPLETLY DIFFERENT OUTDOORS. A lot of people should try it then think agian about wanting to grapple on the street. Joko ninimiya syas in his book that he marketed his school by hanging a heavy bag on a tree and pounding it untill people would ask about him, his school etc. If you remember historically Tatsuo Sensei had an open sky/open air type dojo. You trained rain or shine, cold or hot, etc. The dojo of Japan and Okinawa are constructed as such that the sides raise to allow for the elements to pass through, so to speak. They also had front yards or such that training would happen there as well. Compared to today's air controlled environments, hardwood floors, etc I believe most would find it very uncomfortable and not train. I have found of late that a lot of today's dojo are just country meeting places where the importance is in the buddyships developed. I even had one black belt say that if he had to do it any other way he would not practice karate. Wow, what a statement for a black belt. Anyway, I am getting on the soap box when the posting you put forth is a good one, thanks! Training outside is fabulous! Last summer, I spent many nights outside working with my bo, sai, etc. At out summer camp, we do some training outside as well. It is really nice. Have you read Hayes' book yet? He trained in Okinawa and did training on the beach and also in open-air dojo's that sound so awesome. I train mostly indoors. I find that training outdoors raises a lot of questions and attention. karate, do, karate no talk. Hey, another of my few english jokes. Karate, do. I only trained in my backyard so far and already have been labeled : "the karate-guy" in the neighborhood. Mind you, I have 8-feet-high cedar-trees all around my backyard. Some people have too much time on their hands. Some outdoor training sessions were interesting. We once ran about 5km and stopped in the middle of the woods to hit trees (kotekitai-like). I wonder if it's the same in chinese arts? It's big in japan-ized arts, but what about chinese arts? Is training inside a fairly recent thing? Was it developped as part of the secrecy that accompanied martial arts or as a way to hush things? Or was it simply more of a commodity? More than anything, I need to train these days. I forgot, really like the picture. The guy tied a makiwara to that tree and looks as if he has been pounding on it for days. Hi. This is my first time here, but I think I'll be checking you out every day after going to Dojo Rat. I love what you wrote about training outside. If you think finding an indoor place to use a bo is tough, trying using a tiger fork or Wing Chun pole! I've always been partial to training outdoors, ever since growing up in New England. I live in Florida now and I have a complete kwoon in my carport. I also like to go down to the Hillsborough River to train. I haven't had too many problems. I can ignore the wisecracks. The worse problem though is the idly curious who want to interrupt what I'm doing to ask me questions about it. For several years, I lived in a rough inner city neighborhood and I trained in my yard. I found out later that I developed a reputation as a rough dude among the local punks. I was just working out, but hey, if it makes them think twice about breaking into my house, that's okay too. I love training outside. I've done so many times with the various dojo that I've attended, and each time I've been enamored with the experience. The warm sun, the cooling breeze, the various sounds, the fresh air, and the open horizon. I've trained in rain, in snow, in mud, in sand, in grass, etc and each moment had it's own lesson to teach me. The only "negative" moment that I've experience was when I nearly stepped on wasps who were very, very thirsty from the drought that we were going through that summer. As I was doing my patterns the sweat from my feet was covering the grass around me. Suddenly I felt an odd light thump on the edge of my foot. I looked down to see much of the grass surrounding me covered with wasps drinking in the moisture. They were flying from grass stem to grass stem. I bowed, and backed away slowly to let them have the dojo. Whoa! There's a lesson you can't learn indoors. That's a reminder to me to check my outdoor area before I train.